The oldest pair of pants is 3,000 years old and were discovered in China. One of the early proponents of pants was Joan of Arc. She preferred the traditionally male garment because they were comfortable for combat and horseback riding and it protected her from being groped by soldiers. In 1701, Russian Czar Peter the Great mandated that all Russians should wear pants. In 1873, Levi Strauss introduced jeans for the first time. This style of pants eventually became the classic Levi’s jeans we know today. In some parts of the discussion on the different types of pants, various parts of the pant comes up so we created a custom illustration charting the anatomy of a pair of pants. Popular with both men and women, jeans are among the most widely worn pants anywhere in the world. They are available in a wide range of washes, colors, and styles and one of the biggest advantages of wearing jeans is that you can wear them with nice shirts and blouses or simple t-shirts as well as all types of vests and sweaters, shoes and sandals, and all other clothing items. This means that you can wear comfortable jeans for either a casual or formal look because the jeans made nowadays are made to satisfy both of these looks. Women’s jeans also come in a wide variety of styles, including high-rise jeans, low-rise jeans, and jeans made for a particular body type. Regardless of the shape of your body, you can find jeans that look great and feel great and they also come in a wide selection of colors, styles, and fabrics. Check out the different types of blue jeans for women here and types of blue jeans for men here. Most stores offer a very wide selection of jeans for men, women, and even children. The jeans made by Levi can be viewed here. Khaki pants are usually made of cotton or cotton twill and are extremely comfortable. One of the biggest advantages of wearing khakis is that they are not only very stylish but they also look great with any type of shirt you wear with them. Their colors usually include black, khaki beige, and navy and they can be worn in both casual and more formal settings. In fact, many men wear khakis on “casual Friday” at their workplace because they go great with collared shirts and those with company logos on them. Khaki is also the name of a color that is a dull yellow-brown, which is why these pants are often in this particular color. The materials used in khaki are sometimes used in shirts and jackets so they are great for more than just pants. Most reputable stores carry khaki pants for men, including J.C. Penney, which can be found online. If you want a classic and sophisticated look, pleated pants are the way to go. These pants are very popular with men of all ages and for any occasion so whether you’re just hanging out with a few friends or attending a meeting at your office, pleated pants will help you look good and feel good. 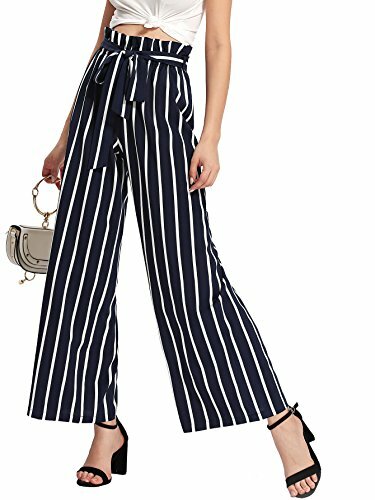 The pleats in these pants are only visible at the top part of the pants in the front and the pants can have a single pleat, three pleats, or even more. More often than not, there are two popular types of pleats: forward pleats, which come from an English tailoring background and consist of pleats that open inwards towards the fly seam of the pants; and reverse pleats, which open outwards towards the pants’ pockets and are more associated with an Italian style of tailoring. If you are heavier than usual or extra stocky, pleated pants can make you look smaller and they tend to be more comfortable when you’re sitting down, which is a big advantage. Because of their flexibility, comfort, and roominess, pleated pants are not likely to lose popularity anytime soon. Cargo pants are great when you want to go hiking or trekking, in part because they are made with sturdy fabrics and are loose and baggy to make them more comfortable. You can move freely in a pair of cargo pants, which is perfect when you’re involved in any type of outdoor activity. In addition, the pockets are great for holding the extra equipment that you often have with you when you’re participating in these types of outdoor activities. Cargo pants are sometimes called combat pants and their large side pockets set them apart from other types of pants. They are casual, very loose-fitting pants that are popular both with men who participate in a lot of outdoor activities and for those who wish to be both comfortable and fashionable at the same time. They offer many advantages besides comfort and they are made in a variety of colors as well in addition to a range of shorts lengths that are made for warmer weather. Cargo pants can be found at stores such as Walmart by viewing their website. Made mostly from synthetic fiber and cotton, these pants offer both a stylish look and great comfort. Although they can be worn in a casual atmosphere, they are most often associated with dressier occasions and are usually worn with a nice dressy shirt or t-shirt. They are similar to khaki pants except that chinos have hidden stitches for a more finished look and they are made of a much lighter fabric than khakis, such as 100% cotton or a cotton weave. They also tend to have a much slimmer cut than khakis, giving them a much dressier and formal look in the end. Companies such as Men’s Wearhouse have great selections of chinos for men, which can be viewed here. Flat-front pants come in a more modern design and go very well with people who are very slim or lighter than usual. They work best if you try them on before buying them so that you get the perfect fit and they look good for both casual and more formal occasions. If the pair of pants you purchase has no pleats in them, this is an indication that they are flat-front pants and they come in a wide variety of colors and materials to suit everyone’s preferences and tastes. Best used as work attire, trousers are very popular with corporate women because they look nice and dressy but are still very comfortable. If you experience long days at the office, trousers are the perfect item to wear and they can be made out of fabrics such as wool, polyester, and cotton. If you wear a formal blouse with them or any other type of dressy shirt, it creates the perfect image for those who wish to be both comfortable and stylish. Any type of pants that goes all the way to the ankles can be called trousers and since they are made in a wide variety of materials, designs, and colors, there are literally thousands of possibilities when you’re looking for these types of pants. You can purchase more than one pair to match a variety of tops and you can even change your top to create a more formal or more casual appearance when you’re done. Whether you’re going to work, to a picnic, or to the mall, trousers are the perfect clothing item to wear. The main characteristic of capri pants is their cropped look as they are only made in a mid-calf length. This means that they are great for warmer weather and because they come in different designs and styles, you can easily choose a pair that goes great with your curves. Capris can also be made out of several different materials, including denim, nylon, cotton, and polyester, but since they are almost always worn in a more casual environment, they are rarely made out of a dressy material. Capri pants are called by other names, including pedal pushers, clam diggers, three-quarter pants, or crop pants because of their length and they are extremely popular with women in the United States, Latin America, Europe, and Asia. Stores such as Kohls have a great selection of capri pants for women, which can be found here. Leggings are very tight-fitting and they are usually made of fabrics such as cotton, denim, or Lycra. Most of the time, leggings look best with a large flowing blouse and they are definitely an item to wear to more casual occasions. They also come in a wide selection of colors, although most women tend to prefer dark-colored leggings because they look great and match any blouse that is worn. Typically, anything that fits close to the skin can be called leggings and most are made out of cotton and spandex. The cotton part helps keep you warm in cooler weather and the spandex helps the leggings fit better. As mentioned above, some leggings are made out of a cotton denim material and these are extremely comfortable and fashionable. Contrary to their name, these pants are not only worn during a yoga or exercise class. 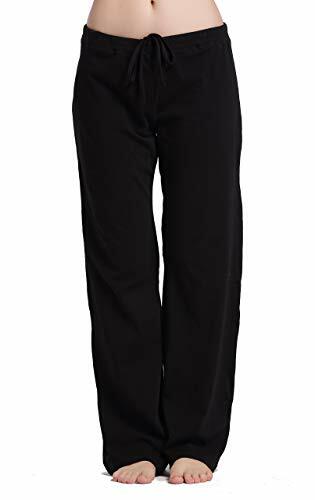 They are some of the most comfortable pants you can wear because they allow you to stretch and move into all sorts of positions and still remain comfortable. Although they are skin-tight, they allow you to move well because they are usually made out of fabrics such as cotton. They also come in a wide selection of shades and colors so you can purchase several pairs and wear them whenever you wish. Some people believe that leggings and yoga pants are the same but there are several differences between the two. Yoga pants, although made to fit you tightly, are not as skin-tight as leggings; in fact, they can be quite loose in certain areas. They also tend to be a lot more colorful than leggings and can be very decorative and eye-catching. The fabric between these two pant types is also somewhat different as yoga pants are made to be worn alone and therefore their material is a lot thicker and opaque. Of course, both of these pants are made for comfort and fashion, which is why they are both so popular nowadays. These pants are usually very loose-fitting and are made to fit women who are leaner in stature. Usually made out of a wrinkle-free fabric, palazzos go great with both trendy blouses and tank tops, making them a great go-to clothing item that every woman should have in her closet. 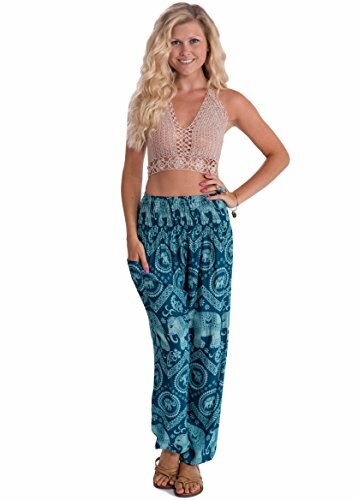 The main characteristic that makes palazzo pants different is the fact that the legs are very wide and the pants themselves are very loose. If you go to a professional fashion show, you will likely see a lot of these types of pants on the runway, in part because they come in such a wide selection of fabrics, prints, designs, and, of course, colors. When it comes to finding the right pair of palazzos, the sky is the limit so regardless of your personal preferences and tastes, you are all but guaranteed to find something you love. Online stores such as Amazon carry a very good selection of palazzos, which can be viewed here. 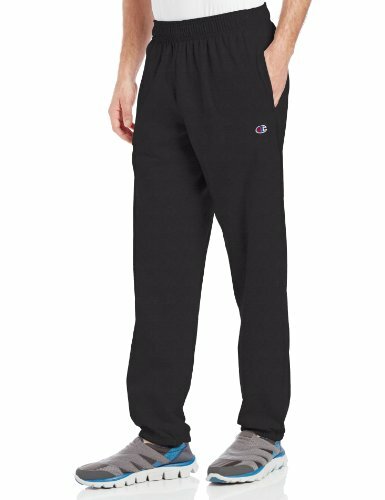 For comfort, relaxation or athletic pursuits, there are sweat pants. Here are examples for men and women. 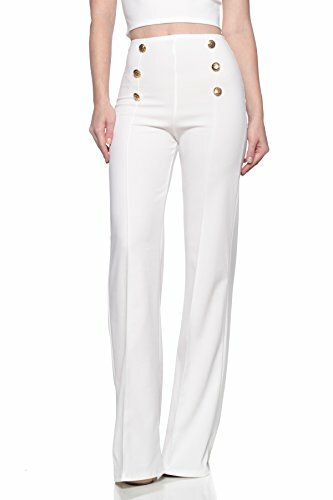 Sailor pants are tight at the waist and flare out at the bottom. They can be full length or to below the knee. They come in a variety of materials (see below). Not terribly popular, but you can still buy them. The most you’ll see them is at Halloween. These pants flare out at the thighs and narrow in to a tight fit at the bottom. Both men and women can wear these. The great part about pants for men is that they come in sizes that fit anyone out there. If you’re a short or slim man, you can find something to fit you. 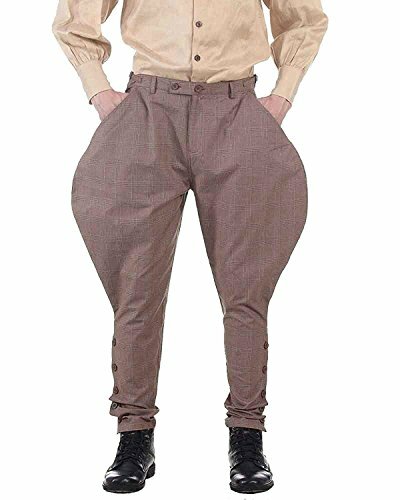 If you’re extra tall or heavy, you can find those types of pants as well because there are now complete stores that cater to men of all sizes. Men’s pants are normally sized by the waist size and the size of the inseam so you need to know these numbers before shopping for pants. Waist sizes are generally available in increments of two and range from 26 inches to 40 inches. Inseams usually range from 30 to 34 inches; however, many of the more reputable men’s clothing shops can take your exact measurements and custom-make a pair of pants just for the client, meaning that you are always guaranteed to get a perfect fit. In addition, another aspect to watch for is the sizes available in relation to where the pants were made because sizes in the U.K. and Europe do not mean the same thing as sizes in the U.S. Most stores have conversion charts for pants made in other countries, which makes finding the right size a lot easier, but, again, taking your measurements first is crucial when you’re getting ready to shop for pants. In order to find the perfect pair of women’s pants, the hips, waist, and inseam are usually measured and women’s pants come in regular sizes as well as petite sizes and plus sizes. Regular sizes range from 0 to 18 in most cases and plus sizes usually start at 12 and can go up to 24 or even higher in some instances. Petite pants come in these same sizes but the only difference is their length. Made specifically for shorter women, petite pants save these women the task of hemming the pants to make them a convenient length. Inseams range from 30 to 34 inches and just the same as men’s pants, once you know what your exact measurements are, it is much easier to find the perfect size of women’s pants. Also as with men’s pants, women’s pants can be manufactured in nearly any part of the world so it is recommended to check on this aspect and use a conversion chart when necessary, especially if you are researching or ordering your pants online. Jeans are always made of a denim material but there are also many types of denim including blue and black denim, dark or light denim, and denim used for jeans, skirts, and even vests and jackets. Denim jeans can even include those with holes in them, faded denim, and a dark denim that gives the pants a very formal and dressy look, even making them appropriate for the workplace. The fabric itself also varies and includes different types such as natural denim, open-end denim, pinto wash denim, poly-core denim, ring or ring-spun denim, and over-twisted denim, to name a few. Until the 1970s, most denim was made out of ring-spun yarn that produced the vintage look and surface unevenness that most people today still recognize. In that decade, the open-end type of denim was introduced, which lowered the cost of denim and therefore of jeans because it omitted part of the spinning process. If you want a softer, textured look and feel today, choose a premium label because most of these companies use a dual-ring-spun type of yarn for their denim. If you want a faded look, choose a pinto-wash look with its mottled appearance that both consumers and designers love. The more you shop for denim, the more varieties you’ll find, and since the comfort level and price vary greatly among each of these materials, it is all but guaranteed that you will find something you love when you shop for your jeans next time. Stores such as American Eagle have very stylish jeans for both men and women, which can be seen at websites such as this. Pants are often made with blends that combine two different fabrics, including synthetic fiber and cotton and even polyester and cotton. Most blends are designed for comfort as well as to make the pants themselves look more stylish. When it comes to blends, you can find dozens of combinations available for pants of all styles and colors. Taking into consideration the area of the country you live in and your own personal tastes and preferences are the best way to decide which fabric blend is right for you. When people think of wool, they think of a fabric that is good for winter wear, and with good reason. A few pairs of wool pants can keep you both warm and comfortable during the winter months but they do much more than that. Wool pants also resist wetness and water and they can trap in heat, fight off the cold, and keep your legs insulated even if it is raining or snowing outside. They are perfect when it’s bitter cold outside but they also do great in the fall when the weather starts to get crisp and cool. High-quality wool is also very soft, adding a lot of comforts as well as protection from the elements. Corduroy is technically a blend of fabrics that are twined together, not just one type of fabric, and corduroy pants are perfect when it’s cool outside but not cold enough to make you want to wear something wool. If you think of corduroy as a hybrid, you’ll understand why wearing corduroy pants is much the same as the various fabrics included in it, because it is a versatile type of material that can be worn during various seasons. A lot of corduroys is breathable and warm but not stiff, which means that you can stay warm in corduroy pants without feeling overheated. Put simply, corduroy is definitely one material that you want to consider when purchasing pants for your closet. Cotton blends are great for warmer weather and there are many reasons why cotton is often combined with polyester when making pants. Both materials are breathable, light, and very comfortable and they both do a great job of whisking away moisture but pants that are not 100% cotton are also able to go longer periods of time without needing to be ironed. In fact, this is why polyester is often added to pants made with cotton because although both are light and feel good against your skin, polyester doesn’t get as wrinkled as cotton, which means that you won’t spend a lot of time at the ironing board.